We will not be hosting a free CEU event in calendar Year 2018. The members and leadership of the TSS felt that we would be directly competing with the FOCUS meeting currently being held in Memphis on May 3rd-4th. Many of our members attend that event. We are in the planning stages of hosting a free CEU event in the Spring of 2019. More information to follow. 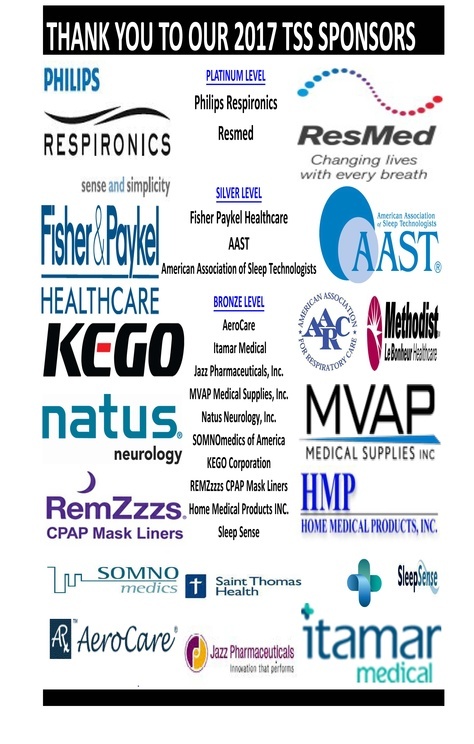 SLEEP 2018, the 32nd annual meeting of the Associated Professional Sleep Societies (APSS), will be held June 2-6 in Baltimore. This comprehensive meeting is the premier forum for sleep medicine and sleep research, and it features a keynote lecture from Eve Van Cauter, PhD, on the Cross-Talk Between Sleep and Circadian Clocks: Mechanisms and Health Implications. There also will be postgraduate courses, symposia, poster presentations, and an exhibit hall with more than 100 exhibitors! SLEEP 2018 also will feature a two-day track that focuses on topics that specifically impact sleep technologists and their day-to-day job requirements. Save up to $75 when you register by April 20 at sleepmeeting.org. Thank you all that attended our event. Presentations will be posted under our registration tab. Please take this time to renew your membership with the Tennessee Sleep Society if you have not done so yet. You do have the option of paying via the website, tnsleep.net, using paypal. For those who have renewed their membership for 2018, thank you for your continued support. The Tennessee Sleep Society is proud to welcome Elizabeth Bledsoe, RPSGT, RST as the newest member of the Board of Trustees. Elizabeth has been a major asset in the field of sleep medicine and we are privileged to work alongside a colleague of her knowledge and expertise. Please take this time to renew your membership with the Tennessee Sleep Society if you have not done so yet. You do have the option of paying via the website, tnsleep.net, using paypal. For those who have renewed their membership for 2016, thank you for your continued support. In April 2016, the Tennessee Sleep Society is planning a day of continuing education in Memphis, TN. Last year we were able to offer our members 8 FREE AAST CEUS in Knoxville, TN. Please watch the website for more information.